It may seem like a bit of a joke but it’s thought that covering your car windows with decals can be a factor in road accidents. 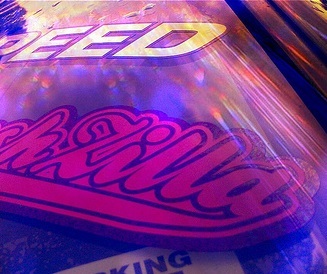 Having big logos or phrases on the rear windscreen can cut down your vision as well as distract following drivers. Rear windscreens can be really small on some modern cars so the vision is pretty bad anyway. Some of those wiper blades you see now are tiny and clear an area the size of a letterbox. Lots of cars out there have the rear windscreen covered with stickers or soft toys and all kinds of other stuff. This is a problem when it comes to changing lanes and you can’t see if the space you want to move in to is clear. Cutting in front of other cars because you can’t see they are there is dangerous and may seem aggressive to other drivers. Use defensive driving skills and leave plenty of room. The Child On Board decal is one of the main offenders as it is quite large. The original idea behind this sticker was to alert emergency services at the scene of an accident that there is a child on board and so give that vehicle priority attention. It was soon found that cars displaying the sticker didn’t actually have a child on board so it was usually a false alarm. The suction cup fitting allows for easy removal when not carrying a child but naturally people forget and just leave it in the window permanently. Emergency services may waste valuable time looking for a child that isn’t there. You’ve got to be able to see when you’re learning to drive. Believe it or not there are plenty of driving instructors who place large decals in the rear windscreen and dangle air fresheners from the rear view mirror. I have seen some driving school cars with decals that almost cover the rear windscreen. This sets a poor example as it looks bad and reduces rear vision for both instructor and pupil. Reversing manoeuvres will be made more dangerous if vision to the rear is blocked. Sometimes stickers will be used as markers to help with reversing but if you rely on these to get you through the test then you won’t be able to reverse without them once you’re out there on your own. It’s tempting to have decals placed on the rear passenger windows but this can easily reduce vision towards the blind spot. Although a lot of drivers neglect to check the blind spot before moving off it is an important area which may contain hidden dangers and should be kept clear and checked each time before moving off. Avoid having tinted rear windows. The amount of vision you get at night is absolutely useless with so much detail lost. Unless you’re carrying a rock star around there’s not really much point. Some people keep so much junk in their cars it really makes me smile. 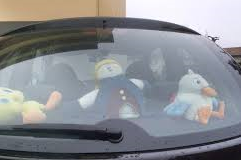 Rows of soft toys all looking out at you through the front windscreen as they sit there on the dashboard. Rows more looking out of the back from the parcel shelf and yet more swinging from the rear view mirror. Take a corner too fast and they’ll be thrown all over the car. Keep it sensible with the odd sticker in the corner of the windscreen or a small mascot secured to the dashboard and we’ll all be safer on the road.